The use of PAM in ecology has been steadily growing for a couple of decades, mainly in bat and cetacean studies. But with sensor costs dropping and audio processing tools improving, there’s currently a massive growth in interest in applying acoustic methods to large-scale or long-term monitoring projects. 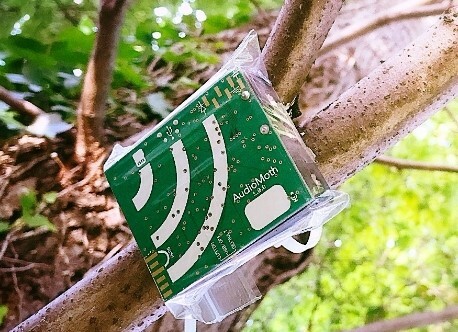 As very low-cost sensors such as AudioMoth start to emerge, it’s becoming easier to deploy large numbers of sensors in the field and start collecting data. This is an exciting development, but it presents some tricky challenges for survey design and data analysis. PAM studies tend to collect a lot of data, often thousands of hours, which are extremely time-consuming to process manually. Estimating species abundance and population trends is also often difficult, because (among other reasons) individual vocalising animals can rarely be identified by their calls alone. We’ve encountered these problems while working on ultrasonic bat monitoring projects (iBats and Bat Detective), and they’re likely to only become more widespread as PAM technologies become more common in ecology. With this in mind, we recently worked with WWF-UK to develop a best-practice guide for PAM across terrestrial and marine realms, conducting surveys and interviews with many PAM users (to whom we’re hugely grateful for sharing their expertise with us). Developing guidelines proved challenging because of the fast-developing nature of the field. It became clear that, for many aspects of PAM study design, there was little consensus around best practices, and there are still some glaring data and knowledge gaps. So we wrote ‘Emerging opportunities and challenges for passive acoustics in ecological assessment and monitoring’. We hope that this synthesis paper will both provide a comprehensive overview of the current state of the field and promote collaboration to improve the prospects for PAM in biodiversity monitoring. Consider Your Analysis Pipeline Before Collecting Data! Perhaps our key finding was the need to carefully consider the entire study pipeline before deploying sensors in the field. New sensor models are reducing the costs associated with data collection, but often less thought is given to how the audio data will be stored and analysed. For population studies, PAM analysis generally requires automated algorithms to process audio and identify target sounds, for example the calls of a target species. Although the accuracy of the underlying machine learning methods is fast improving, their performance still ultimately depends on having good quality reference data. This means that having large sound libraries containing many examples of calls from taxa of interest is important (the recently compiled call libraries for Mexican bats are a great example of this). These have not yet been collected for most species and biomes, and problematically from a conservation perspective, reference data availability is poorest for tropical and subtropical regions that often most urgently require monitoring. So new PAM studies may need to collect their own reference data and then train and test their own analysis tools and study protocols. This adds time, cost and complexity to a project. At the very least, it’s worth carefully weighing up these issues and identifying what existing software tools or reference data are already out there, before you start collecting any data. On the positive side, as more ecologists use PAM technologies and collect reference data, this opens up opportunities for community development of large, open-source sound libraries, as resources for the field as a whole. In ‘Emerging opportunities and challenges for passive acoustics in ecological assessment and monitoring’ we discuss examples of where these kinds of databases (such as MobySound for marine mammals and Xeno-Canto for birds) are already being usefully applied to challenges in biodiversity monitoring. Acoustic sensing technologies offer the unique opportunity to rapidly quantify and compare the diversity of entire vocalising animal communities across habitats, space and time. The last decade has seen a whole subdiscipline emerge based on this idea. Often called ‘ecoacoustics’, this field focuses on developing metrics to measure acoustic community diversity and other ecologically-relevant sound. Locally these can offer useful proxies for species diversity or disturbance along environmental or disturbance gradients. They’ve been used in settings ranging from marine reefs to forests. Based on current evidence though, it’s still unclear how broadly these metrics can be applied to biodiversity monitoring across different habitat types and ecoregions. But this is an active area and, if some of its conceptual and methodological issues can be resolved, it offers real potential for rapid, large-scale acoustic biodiversity studies. Another exciting possibility for PAM looking forward is real-time monitoring of species, communities and human disturbance (e.g. poaching, industrial noise) using networks of sensors. For example, an autonomous sensor network, based on wireless data transmission and unsupervised machine learning, is currently being trialled for community monitoring in disturbed rainforests in Borneo. Our group at University College London, led by Prof. Kate Jones, has recently been involved in developing a real-time urban bat monitoring system. This involves a network of sensors which continuously run bat call detection algorithms on the live audio stream. The bat calls are reported live to a publicly accessible website, 24-hours a day, 7 days a week. As well as being a great tool for public engagement with urban ecology, the network is collecting bat activity data at extremely fine temporal resolution, allowing us to explore the fine scale impacts of, for example, human activities or weather on bat activity patterns. Ultimately, we argue that moving towards robust ecological trends from larger-scale PAM projects – which may, for example, involve citizen scientists in data collection – requires quantifying the many different sources of uncertainty that affect PAM data. 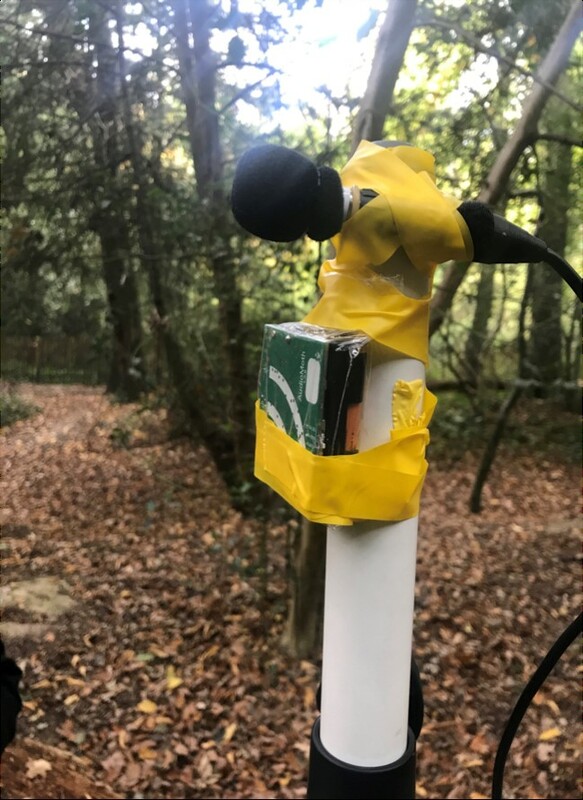 For example, to inform the design of a new citizen-science based bat survey, we have recently been testing how different microphones and sensor models impact the probability of detecting different bat species across habitats and distances. The ultimate aim will be to improve our ability to estimate bat abundance. Data and knowledge gaps like these are now being addressed across taxa and ecological realms, and integration between the marine and terrestrial PAM communities is improving. All of this means that passive acoustic methods are becoming an increasingly viable complement to other sensing technologies for quantifying the impact of human activities on animal ecology, behaviour and biodiversity. To find out more, read our Open Access review paper at Methods in Ecology and Evolution, ‘Emerging opportunities and challenges for passive acoustics in ecological assessment and monitoring’. This entry was posted in Conservation and management, Methods papers and tagged AudioMoth, Bats, Behavioural Ecology, Bioacoustics, biodiversity, Cetaceans, citizen science, Ecological Monitoring, Passive Acoustic Monitoring, Real-Time Ecological Monitoring by Chris Grieves. Bookmark the permalink.